Catering environments are hard on the feet and on footwear, for restaurant service staff, housekeepers or kitchen workers. 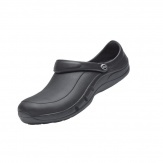 Smart but rugged catering shoes, boots and slip-ons from high quality, trusted household name brands like Birkenstock, Crocs and Klogs will pay for themselves over time in terms of their lifespan and the health of your feet. 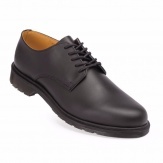 We also stock Slipbuster shoes with oil resistant soles and ankle support to reduce the risk of injury from slips and trips, particularly worthwhile in catering environments with risk of liquid spills or when working frequently with greasy substances. The broad range of footwear available at Catering Appliance Superstore is designed so you are able to find a style appropriate for your particular catering role, but all have the same high quality of construction and long life in a hard wearing environment.